In this photo taken on Friday, Sept. 15, 2017, Belarusian army vehicles drive during the war games at an undisclosed location in Belarus. Russia and Belarus began major war games Thursday, an operation involving thousands of troops, tanks and aircraft on NATO's eastern edge. A senior NATO official says there's reason to be concerned about the large-scale Zapad 2017 military maneuvers being conducted now by Russia and Belarus, since they could be seen as "a serious preparation for big war." General Petr Pavel, head of NATO's Military Committee, told the Associated Press in an interview Saturday that NATO is increasing efforts to re-establish the military-to-military communications with Russia to avoid any "unintended consequences of potential incidents during the exercise." 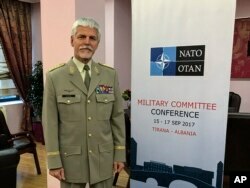 The defense chiefs of NATO member countries were holding their annual conference this year in the Albanian capital of Tirana to discuss fighting terrorism, the situation in the Western Balkans and the new U.S. strategy on Afghanistan. The Zapad war games, being conducted this year mostly in Belarus, run until September 20 and reportedly involve 5,500 Russian and 7,200 Belarusian troops. Despite assurances from Moscow that "NATO is not considered as an enemy" and that "the exercise is not aimed at NATO," Pavel said Russians have not been transparent about the facts of the exercises. He says the number of troops in the exercises — which the Russians say is about 12,700 — could actually be between 70,000 to 100,000. Gen. Petr Pavel, head of NATO's Military Committee, poses during an interview with the Associated Press, in Tirana, Albania, Sept. 16, 2017. Pavel said the Zapad 2017 military maneuvers being conducted now by Russia and Belarus could be seen as "a serious preparation for big war." "All together, what we see is a serious preparation for big war," he told The Associated Press. "When we only look at the exercise that is presented by Russia, there should be no worry. But when we look at the big picture, we have to be worried, because Russia was not transparent." Two weeks ago, Pavel met with the head of the Russian military's General Staff, General Valery Gerasimov. The Supreme Allied Commander for Europe, General Curtis Scaparrotti, had a phone call with Gerasimov at the beginning of Zapad 17. Pavel said it was "mainly focused on transparency and risk reduction and avoidance of unintended consequences of potential incidents." "We have a high concentration of troops in the Baltics. We have a high concentration of troops in the Black Sea, and potential for an incident may be quite high because of a human mistake, because of a technology failure," said Pavel. "We have to be sure that such an unintended incident will not escalate into conflict." In this photo taken Sept. 14, 2017, Belarus' soldiers aim an anti-aircraft gun at a training ground at an undisclosed location in Belarus. Russia and Belarus began major war games this week thousands of troops, tanks and aircraft. The Military Committee offers consensus-based advice on how the alliance can best meet global security challenges. Stability and security in the Western Balkan countries was also discussed during the conference. Pavel said trouble in the region could come from radicalism, organized crime, migration, economic problems or the "malign influence from Russia." "We do not compete with Russia for the Western Balkans. We are primarily focused on the Balkans being stable and secure," he said. He also added there was no plan for reducing troops in Kosovo or setting a time length for their presence. About 4,500 troops from 31 countries have been deployed in Kosovo since June 1999, after NATO's 78-day air campaign to stop a deadly Serbian crackdown against ethnic Albanian separatists. Kosovo declared independence from Serbia in 2008, but Serbia has not recognized it.